These Arctic Bars, were something I heard about from my brother and sister in law; a rich, chocolate brownie topped with creamy vanilla ice cream, smothered with a cracking chocolate coating. Seriously, how could one not love that? If you had the version my brother and sister in law speak of then these bad boys would be served up with a little bowl of warm caramel sauce... I can hear your sighs from here. Positively sinful. Naturally, I set about whipping up my own version and I must say, I do believe I earned 'sister in law of the year' title for serving these up after a recent, rather loud, family dinner. I've got a little more deliciousness to share...I'm so excited to let you all know that I will be at the September 18th Perth Upmarket again with a market stall full of Gluten Free Scallywag baked treats, including the magazines and possibly something a little extra I've been working on. I've created a little facebook event you can subscribe to and keep yourself up to date with behind the scenes recipe testing, news and of course pre-order and menu information. It was a blast meeting so many Perth folk at the June Upmarket and I can't wait for September! The thing I love about these Arctic Bars is that they are very simple to make, even though there are a few steps and because they are a frozen treat you can make them well in advance. The fun part is that you can use whatever ice cream is your favourite! A chocolate caramel swirl would be amazing but I think if I make a peppermint choc chip version of these my man would love me just a little bit more. So, go crazy and let me know what flavour combo you go with! Preheat your oven to 170 degrees Celsius. Line two brownie trays (approx 28cm x 18cm) with baking paper. In a medium, heavy based saucepan over low heat melt together the butter, sugar and chocolate. Do not boil the chocolate mixture, you simply want it all to melt and the sugar to dissolve so that it's not gritty. Allow to cool. When cooled stir in the whisked eggs and sift over the flour and cocoa. Stir to combine; do not overmix as you'll end up with a tough brownie. Divide brownie batter between trays and bake for approximately 20 minutes, a skewer inserted will come out clean. While the brownie cools soften the ice cream by removing it from the freezer. When the brownie is cool and the ice cream has softened divide the ice cream between the two trays of brownie and spread over evenly, smoothing the top. Return to the freezer to freeze solid. When the ice cream has frozen solid remove the brownie ice creams from the freezer and using a large knife cut the brownie lenthways in half and then across in sections to create 14 bars. Using a hot knife, I run mine under hot water, will create a nice cut. Wipe the blade of the knife after each cut so that crumbs don't appear on the top of the ice cream. Place a large cake rack over a piece of baking paper. This will catch the chocolate drips from the coating process. Melt the chocolate and coconut oil together in a double boiler. Remove a tray of brownie ice cream bars from the freezer and separate. Working quickly dip individual bars into the chocolate upside down to coat the top and sides. I didn't bother with the bottom as it's too messy. Place coated bars on the cake rack. Continue with one brownie's worth. when the chocolate has hardened, this won't take long with the cold ice cream, carefully transfer to a freezer proof container and place them in the freezer. Continue with remaining brownie and re-warm the chocolate if required. I leave mine over a bowl of warm water to stay melted throughout this process. Enjoy straight from the freezer, with or without caramel sauce. Will keep for about a month in the freezer. My nearly one and a half year old (holy cr%p where did that time go?!) also loves these gluten free muffins, which is wonderful as they are such a healthy nutritious snack for a small child (and they're nut free, so perfect for school lunchboxes) and perfect to fit in their little hands at the high chair, or more importantly when you're out and about, they fit into a small container or ziplock bag so that there's still plenty of space in your handbag for a water bottle, wipes, spare nappy, oh and my wallet and phone for me. Yep, that's my life now; #mumlife ! 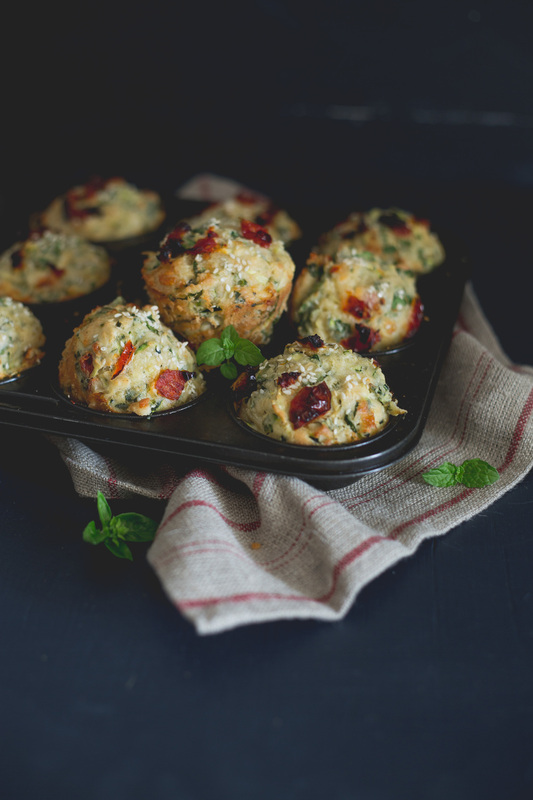 Don't get me wrong though, these are definitely a grown up veggie muffin. I love them as an on-the-go morning munch with our little cookie. I like to keep half the batch in the freezer so I can quickly defrost them in the oven or microwave for those 'oh, sh*t I have nothing to eat' moments! (I don't do well when I'm hungry, can't you tell?!?) Let's face it, as humans and especially I've found as parents (and I'm pretty damn organised) this happens so having half the batch frozen means I'm never in a bind of having nothing on hand that's nutritious and gluten free. SO, ABOUT THAT NEWS.... I'm super excited to share that I'm going to have a stall at the next Perth Upmarket held at UWA on June 26th! My awesome little stall will be overflowing with delicious baked goodies and I'll also have Vol 3 and Vol 4 of The Gluten Free Scallywag Magazine (ahem, cookbook!) on sale! I'll be updating my shop soon so that you can pre-order cake or the mag and collect it at the markets. All you'll need then is a coffee to enjoy it with. If you're like me and are sometimes forgetful you can subscribe to the event on my facebook page and it will remind you on the day that there's some serious deliciousness to be had! I'd love for you to pop on by and say hi and of course walk away with some kick arse gluten free cake. If you live in Perth I can't wait to see you there! I love that these muffins contain no white flours, just whole grain gluten free brown rice and quinoa or buckwheat flour. I change it up with whatever I have on hand and you can definitely use 200g brown rice flour. I've not tried these with any pre-made flours. The batter with be quite solid when mixed, this is not a wet muffin batter at all, much more like a thick white cake batter. You can change up the zucchini to whatever grated veg you like, carrot works well too. I like to line the base of my cupcake tins with a round of baking paper to guarantee the bottoms from sticking, but you could generously oil the tin if you prefer. I don't recommend using paper muffin or cupcake liners as the mixture does tend to stick to them a little and you lose all that glorious soft crunch on the outside of the muffin. In a medium bowl or just whisk together the eggs, oil and yoghurt to combine. 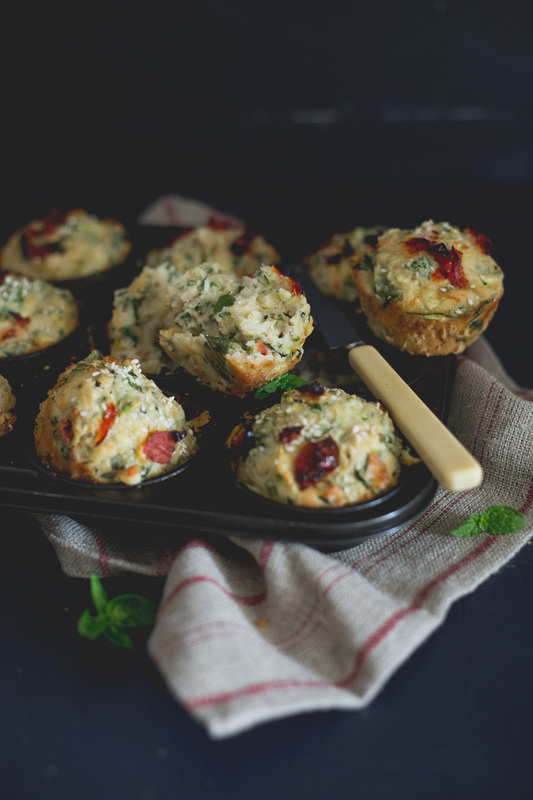 In a large bowl whisk together the flours and baking powder, stir in the zucchini (with the juices), cheese, spinach, herbs, half the sundried tomatoes and a pinch of pepper. Stir to coat the fresh ingredients with the flour. Pour the the egg mixture into the vegetable mixture and stir to combine. Scoop 1/3cup batter into the prepared cupcake tray. Smooth the tops a little and sprinkle with the remaining half o the sundried tomatoes and a sprinkle of seeds. Bake for 16-18 minutes. A skewer inserted will come out just clean and the tops should be slightly domed and lightly golden. Cool in tray for 5minutes before tipping out onto a cooling rack to cool completely. Best enjoyed warm on the day they're made but are also delightful a few days later when warmed through. Store in an airtight container in the fridge for up to 5days, or freeze in zip-lock bags for later. 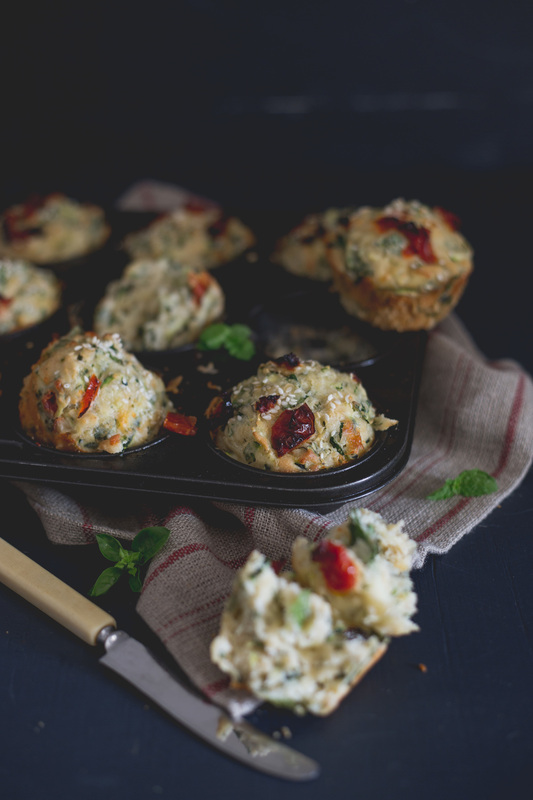 I've not tried these glorious gluten free vegetable muffins with pre-made or white flours. I'd love to hear back from you if you do. What flavour combo will you try? It's been a while between biscuits, actually it hasn't been since the birth of our little cookie that I shared a biscuit recipe with you! This parenting lark is hard work of the most rewarding kind. 16 months into the journey and our little fellow continues to amaze us with the way he learns and in the little cheeky faces he pulls, some so very serious. As our little cookie pulls faces and sometimes keeps us up all night teething, giving us a work out running around the playgrounds after him (thank goodness, because after all these biscuits...) well, I'm working on something a little different and I'm looking forward to sharing it with you guys soon! In the meantime lets take a minute to reflect on these ANZAC biscuits and the history that they represent. A more important biscuit in our Australian history you will not find. These gluten free ANZAC biscuits are crunchy on the outside and chewy in the middle, just like my Mum used to make them. You've simply got to bake a batch, I'm happy to come over and eat one (or three) when you do! This recipe is adapted from a recipe in Vol 4 of The Gluten Free Scallywag Magazine. I use crushed gluten free cereal instead of oats. Of course oats might be ok for you where you live but in Australia the Coeliac Society's standard is no oats for people with Coeliac Disease. You can read more about that here. Feel free to substitute the flours for your favourite gluten free flours, or flour mix totaling 120g. If you are after a crunchier ANZAC flatten the biscuits a little extra and bake for a further minute. Preheat your oven to 160 degrees Celsius. Line two baking trays with baking paper. In a large bowl combine the crushed cereal, flours, sugar and coconut. In a small saucepan melt the golden syrup and butter until just bubbling. Use a low heat so that it doesn't catch and stir often. Working quickly mix together the bi-carb and hot water in a small bowl and pour into the melted butter. It will foam up, quickly stir it and pour into your dry ingredients. Mix well. Press and roll tablespoons of mixture (the mixture is a little crumbly, hense the pressing prior to rolling) into balls and place 5cm apart on the prepared baking trays. Continue with remaining dough. Press down slightly with the palm of your hand. Bake for 12 minutes for chewy ANZACS or 14-15 minutes for crunchier ones. Cool on trays for 5 minutes before transferring to a cooling rack. Will keep for 5 days in an airtight container. *disclaimer - I was sent a box of the new Kellogg's Gluten Free Special K which I used in this recipe. PS. I've moved my blog to a new platform so that I have a better space to share recipes with you and have a nicer 'shopfront' for you to peruse and purchase from - you can check out the shop here. As a result there are a whole bunch of broken recipe links (and pinterest - wah!) which I'm working on fixing. I'm so sorry if you can't find what you're looking for but there's a handy little search function on the top right sidebar that will find the recipes you're looking for as I update the recipe index.